Medical Calendar is an easy-to-use scheduler for doctors that'll free you from a great deal of writing routine. This handy scheduling software will suit perfectly for a single physician as well as for a whole health center. It will help you to quickly create a competently organized schedule for the whole staff. If you want to have your reception hours at hand and don't want to miss any important job-related events, then Medical Calendar is just what the doctor ordered! 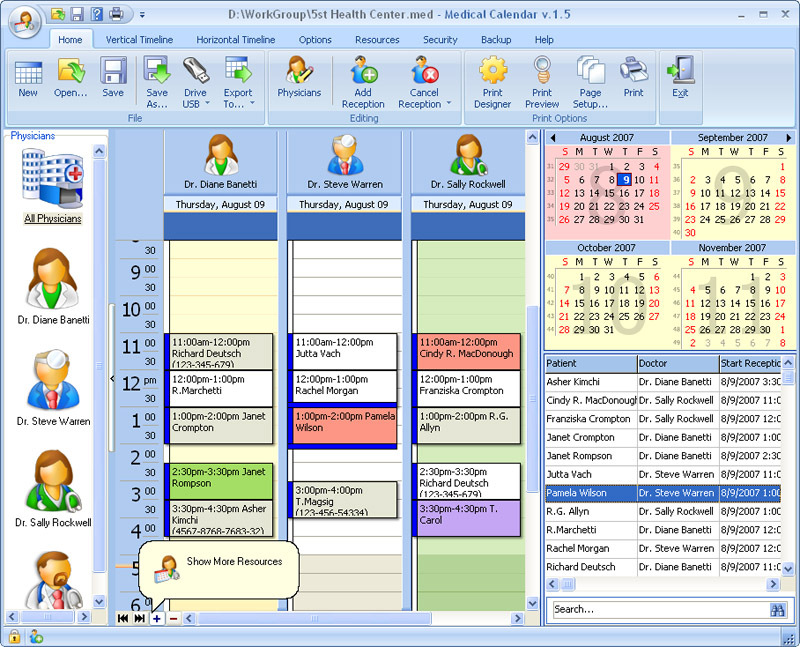 Medical Calendar is delivered in a classy interface both intuitive and stylish, making schedule management a piece a cake. Each doctor can create a profile to run his personal schedule. You can instantly switch between profiles to view the schedule of any specialist at any given moment. For your convenience Medical Calendar also allows viewing multiple profiles at a time, to view the schedules of several or even all doctors simultaneously. The creators of Medical Calendar have done a great job in crafting the Date Navigator that makes the scheduler extremely easy-to-use. At any time you can jump to the required date, edit reception hours, patient data, etc. You can change time intervals from a detailed day schedule to a brief quarter overview in order to provide yourself with the most fitting schedule. To safeguard your data, you can also take advantage of the adjustable Auto Backup feature and save the data to the secured archive. Additionally, the schedule can be exported to a variety of formats, including MS Outlook, XML, HTML, XLS, TXT. Exchanging data with other applications (Apple iCal, Google Calendar, Windows Calendar, Microsoft Exchange Server and Novell GroupWise) is made easier with the new support for the iCal data format. Thus you can use your schedule in different applications. When you need a printout of your schedule, you'll certainly appreciate the powerful Print Designer. It'll help you to print your schedule in the most convenient form, choosing from a number of templates.